The Andromeda galaxy lies 2.5 million light-years away and looks like a faint spindle, about 6 times the diameter of the full Moon. It is considered a near-twin to the Milky Way galaxy. 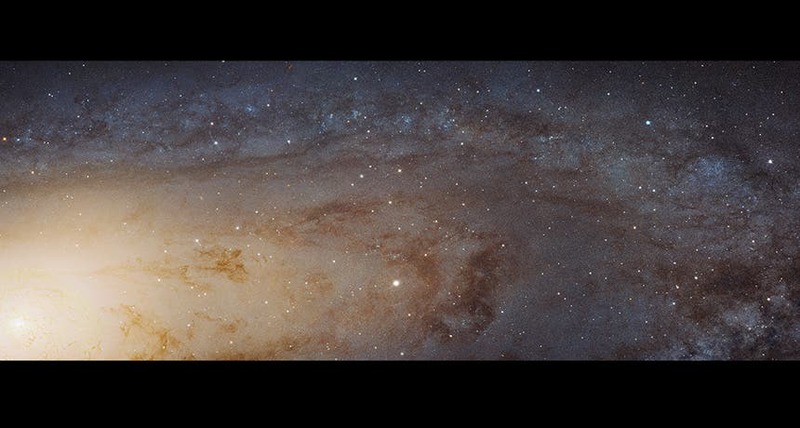 The image above shows a 61,000 light-year-long swath of the Andromeda galaxy appears in this mosaic of more than 7,000 images from the Hubble Space Telescope. 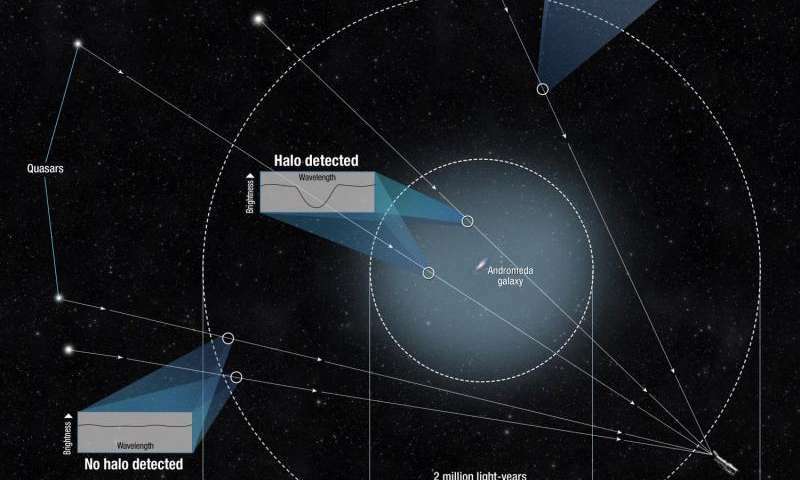 "As the light from the quasars travels toward Hubble, the halo's gas will absorb some of that light and make the quasar appear a little darker in just a very small wavelength range," explains co-investigator J. Christopher Howk, also of Notre Dame. "By measuring the dip in brightness in that range, we can tell how much halo gas from Andromeda there is between us and that quasar." The scientists used Hubble's unique capability to study the ultraviolet light from the quasars. Ultraviolet light is absorbed by Earth's atmosphere, which makes it difficult to observe with a ground-based telescope. The team drew from about 5 years' worth of observations stored in the Hubble data archive to conduct this research. Many previous Hubble campaigns have used quasars to study gas much farther away than — but in the general direction of — Andromeda, so a treasure trove of data already existed.